Yikes! It's been crazy these last few weeks, I have tests, presentations, papers, finals, etc. And I realized today that my practice run of my presentation for this trip is due at 4 before we go off for a formal dinner tonight! I'm so glad I spent so much time in 4-H! Big shout out to Mrs. Paulette right now for getting me into presenting and teaching me how to do so on or off the cuff. In the mean time, I have to move out of my dorm by the end of next week and get all my stuff packed for the trip! I'm glad it's a straight flight, maybe I will finally sleep on a plane! Even though I was not born a southerner, I have a very high appreciation of southern food, but when Mr. Jeff and I walked out of the travel agency after dropping off my pictures and application for my Chinese visa, I realized that nothing had ever smelled so good. The smells radiating from across the road were too much to handle, so we decided that we had to go try some of this amazing food. Walking in, it was very easy to tell that we were in the right place. First off, they were wondering how we had stumbled into this place in what we dubbed "Korea town" and then, we realized that we were the only non-Korean speaking people inside.That is how we knew we were about to get a remarkable ethnic experience. But first, we had to figure out what to order! 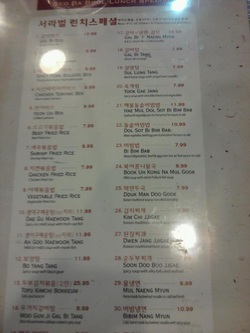 The menu was mostly in Korean, which added to the knowledge that this would be good. So we spend some time trying to figure out what we are reading and what we should order. Mr. Jeff called Boyoung and chose the Bulgogi. I read something in a subtitle about a hot pot and had to investigate further so I ordered the Dol Sot Bi Bim Bap. It was at this point that I actually took a second to ignore the mouth watering scents filling the restaurant and take a look around. It was a very nice set up, it looked formal and I felt under dressed in my t-shirt and jeans. There were some private rooms, some tables that are normal over here and then there were some tables with griddles in the middle of them. Mr. Jeff and I were glad we didn't sit there as we would have been completely lost as to what to do! Shortly after I had completely my round, our waitress brought out these seven small dishes with different types of food that I had never seen before. I was so excited, I grabbed the chopsticks and was starting wide-eyed at the deliciousness being placed before me. 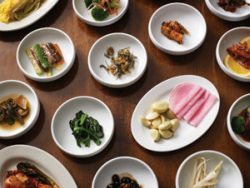 There were two different types of Kim Chi, spinach, potatoes, sardines, squid and this other dish (middle of bottom row), that was amazing and if I remember correctly, Boyoung said was made from some sort of leaf. There was such flavor to it all! If I wasn't excited before, I was ecstatic now. We were only about half way through these dishes when the waitress came back with the actual meal. Mine was in this large bowl that I think was made of cast iron. It was really hot! The food was still cooking as it sat in front of me! Just sizzling away, I was astounded by this, she told me to mix it with this thing of hot sauce that she brought with her. I'm a bit careful with potentially super spicy things, so I tried a little bit of it and again the flavor. Oh my gosh. I was in love with this food. I readily added it to my hot pot and mixed - with the spoon - as she had instructed. 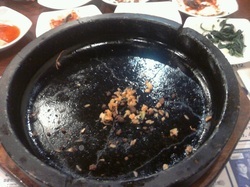 Finally, I grabbed my chopsticks again and dug into this sizzling pot of food. If I haven't mentioned yet how amazing this food was, allow to make this perfectly clear. I was on cloud nine. There was so much flavor and it was all so good! As it turns out the Dol Sot Bi Bim Bap consists of beef, egg, rice and mixed vegetables. 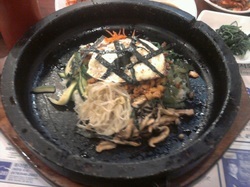 I recognized mushrooms, seaweed, bean sprouts and carrots, while I believe the other was zucchini, but I'm not certain. Regardless, I was so happy to be eating this. I ate all I could pick up with my chopsticks. Mr. Jeff ate pretty much all of his Bulgogi, which I was fascinated to learn that you wrap the meat along with some sauce in lettuce. He wanted a little more spice to it, so the waitress brought out some form of radish for him to add to it. I didn't try it all together as I was working on my own awesome food, but that was some good meat! 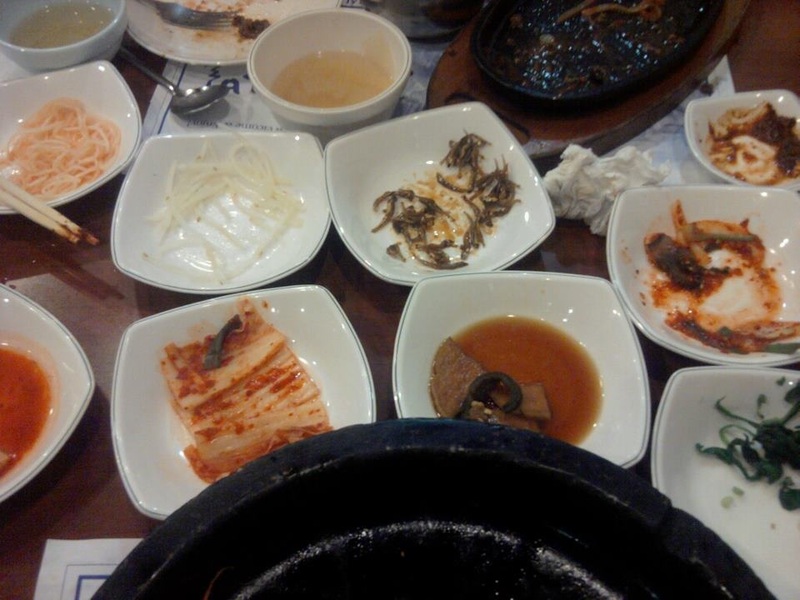 We think we did pretty well on all the little dishes too. 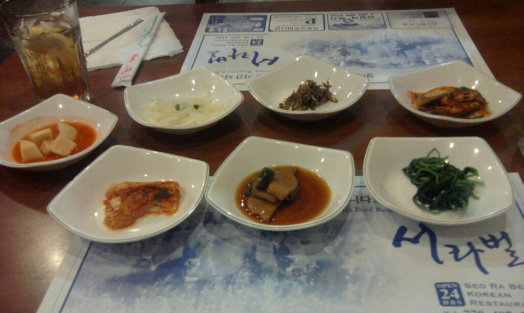 I am now really excited to go to Korea and eat more of this amazing food!